The digital shift has brought swift and drastic changes to the audiovisual sector. Directors have been experiencing this in their craft on a daily basis, from the evolution of technology on set and in post production to new trends in story-telling. With new proposals from the Commission that promise to shift our copyright, this is an important time of change for us and our sector, and we need to understand the road ahead. When the new Commission came into office in late 2014, it decided to accelerate this path to the future by creating a « Digital Single Market » which, in its view, must tear down regulatory walls and bring down the existing barriers online, because « citizens miss out on goods and services, internet companies and start-ups have their horizons limited, and businesses and governments cannot fully benefit from digital tools ». No one doubts that our European audiovisual sector is undergoing a profound shift, particularly in the field of distribution, and there is still a lot of change to come. But it’s a fragile commercial ecology, a reality that must not be overlooked : the importance of territorial exclusivity of rights in particular, which not only informs the public funding of works, but also the licensing practices to distribute them, and which give rise to the investment in new films, TV series, documentaries, etc. Over the last year, FERA has been deeply engaged in lobbying on your behalf over the Commission’s proposals to legislate in this area. The Commission’s slightly obsessive response to the digital shift in the audiovisual field is mostly focused on EU consumers’ cross-border access to films, TV series or football games. We have repeatedly expressed our concern that this threatens the very investment and distribution structure of our sector. 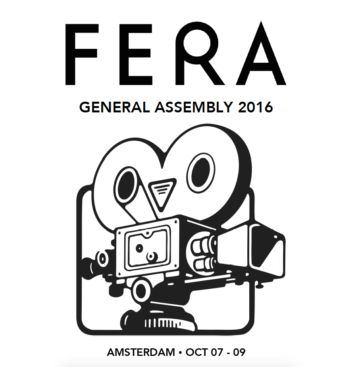 FERA will continue to work with other industry stakeholders in Brussels, ranging from film agencies to commercial operators, to promote a sustainable framework for our industry. It’s an important moment for us : finally our arguments on fair remuneration are being heard, and we have an historic opportunity to change for good remuneration terms for our members, by strengthening our rights. This year, our aim for the General Assembly is to create a forum in which we European directors can discuss how to get to grips with this new reality : how we can retain our status as creative leaders in the new digital era, what the Commission’s proposal mean for us and our rights – and what we must do to change them for the better. You can download the detailed programme here.